Xiaomi may finally be closing in on an announcement for the much anticipated Mi A2. The phone is already running benchmarks on Geekbench so it has to be close to an unveil. It's well known that the Xiaomi Mi A2 is the stock Android counterpart to the Xiaomi Mi 6X, just like the Mi A1 was to the MIUI-running Mi 5X. As such, the Mi A2 packs identical hardware to the Mi 6X - a 5.99-inch LCD screen, 12MP+20MP dual camera on the back, 20MP camera on the front and a Snapdragon 660 chipset with either 4GB or 6GB of RAM. 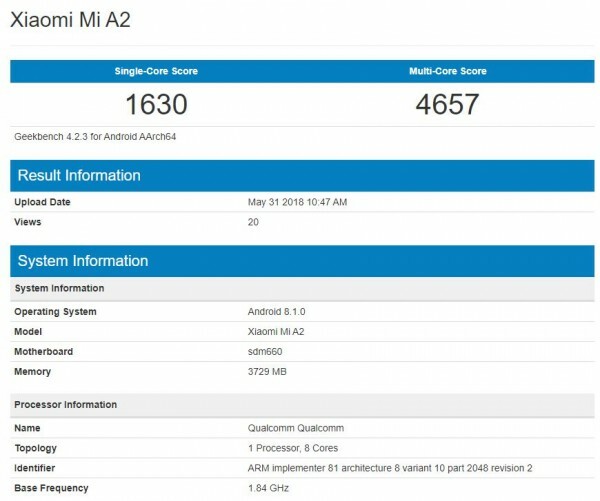 As you can see, the Mi A2 that ran Geekbench has 4GB of RAM and is running on Android 8.1. The Xiaomi Mi 5X was announced in August and the Mi A1 in September. Judging by that time frame, the Mi 6X was announced in April so we expect the Mi A2 to become official very soon. You need SD card for 64 or 128 GB? ?